Phonics activities like this card, provide the perfect opportunity for a more subtle reminder. While those little hands are colouring, you are reinforcing the phonemes that the children have already started to learn. 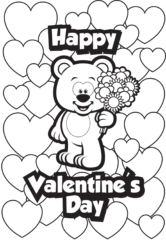 Print the Valentine’s Day Card here. Have the students colour in their card, encouraging them to write their favourite graphemes on the inside with the message. QUICK NOTE: Don’t forget to also check out our Valentine’s Day Phoneme Bunting from a previous year’s free resource collection. You can find it here.